A very promising game that is let down by repetitive quests and underdeveloped gameplay. Still, I can see this engine being a major factor in a much better game. Might still be worth playing as a time-capsule type game. I didn't care about Altair at all and that limited the journey somewhat, but on the opposing side, we start to get intrigue as Desmond is being captured, manipulated and whatnot in this title. Ending has a nice cliffhanger even if the buildup's a bit uneven. 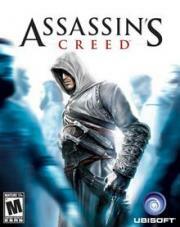 It's not a surprise that this spawned one of the biggest franchises in modern gaming, but the original is pretty stark compared to what Ubisoft shoved into later installments. It's really just a forgettable stealth game with a neat historical skin thrown on it. The gameplay was innovative once upon in the time. The general plot it's trash but we know it now, then there was at least the hope that it was something interesting. Its a testament to the game's world building, brilliant atmosphere (for the time) and fun parkour navigation, that it''s less-than inspired and repetitive gameplay didn't turn me off from playing through it more than once.